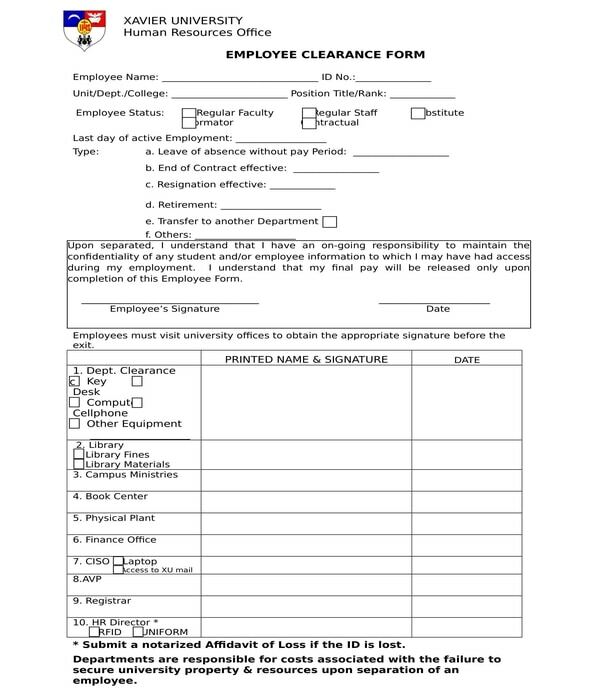 School clearance forms are documents which are to be used for indicating that a required action has been executed and that the parties involved can proceed to other actions in lieu of the subject of the clearance. Most school clearance forms are provided to students after the end of a semester in order for them to know the required documents and materials that they must submit or return to the school for them to be permitted in proceeding to the next semester or grade level. Step 1: Mark the corners for the form based on the size of the print paper to use. Marking the corners and sides will ensure that the contents to be placed in the form will not go beyond the size of the print paper in the event that the school clearance form will be printed out for physical use. Step 2: Input and place the name and logo of the school, as well as the title of the form. In order to place the name, logo, and title at the center portion of the intended area for the form, the cells of the columns leading to the center must be merged together. Then the texts can be inputted while the logo of the school can be placed in two merged rows or columns aligning the texts of the name of the school and the title of the form. Step 3: State a welcome note. The welcome note should have a greeting intended for the user of the form. There must also be a salutation to address the user properly with the name of the user. Step 4: Enlist the required items to be completed. Rows and columns must be marked for this section of the form. There should be one column for the initials of the user of the form and another column for the list of required items which should be beside the initial column. Step 5: Add a signature block. The signature block must not only have an area for the signature of the user but also the authorized officers or personnel of the school administration who will verify and validate the claims of the user about his completed submissions. After the contents of the school clearance form have been placed and finalized, the form must be saved. The option of whether or not to convert the form into another format such as in “.PDF” or in “.DOC”. Before converting, however, the type of format to use must be decided with finality in order to have an assurance since different formats are intended to be used for different purposes. Specifically, the best format to consider using for the website of the school is the “.PDF” format or the portable document file format, while the easiest and the most common format to prepare and use for printing purposes is the “.DOC” or the word document file format. 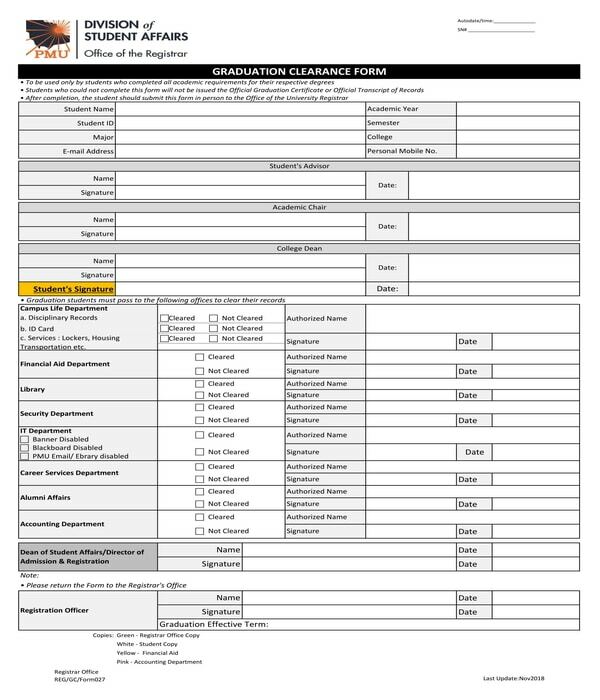 Graduation Clearance Form – The objective of a graduation clearance form is to document that a student has fulfilled the requirements of his course permitting him to participate and be part of the school’s graduation rites ceremony. The details to be disclosed in the graduation clearance form includes the name, identification number, academic year attended, semester, and the personal contact number of the student. The signatures of the student’s advisor, academic chair, and the school’s dean will also be needed to complete the graduation clearance form. Below the signature blocks of the aforementioned school authorities is the list of requirements to be completed by the student for him to be able to graduate. Then, the form must be submitted to the dean of students’ affairs to have the clearance validated. After which, the form will be sent to the registrar of the school wherein the data and information disclosed in the form will be registered and be recorded to enlist the student for the graduation. 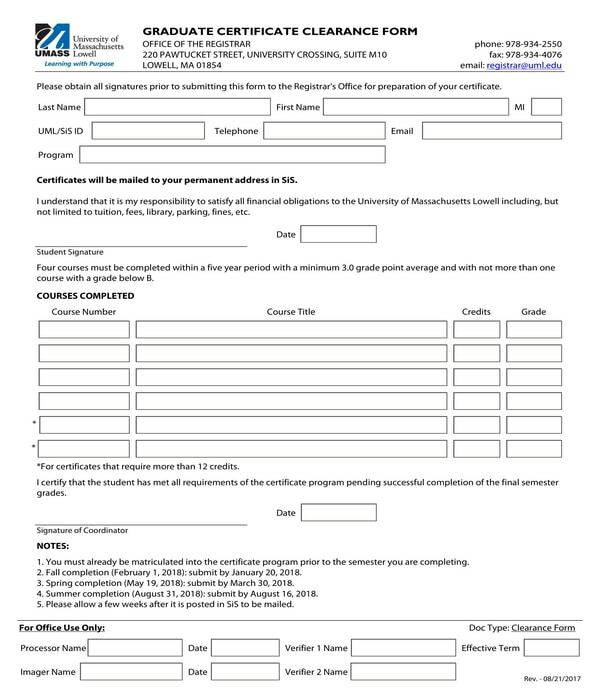 Graduate Certificate Clearance Form – Students who have graduated from a course are the users of graduate certificate clearance forms. The form will be for informing the administration about the contact information of the student including his address, and the credit details of the student to prove that he is eligible for obtaining the graduate certificate form. Some of the data to be inputted in the form are the full name of the student, the course program that he is enrolled in, the address where his certificate will be mailed to, and the date when he used the form. In addition, the course details of the student should have the course number, title, amount of credits earned, and the grade that the student acquired for the course. Moreover, to complete the form, the signature of the student’s course coordinator should be affixed as well as the approval of the personnel who verified the clearance at the intended area of the form. 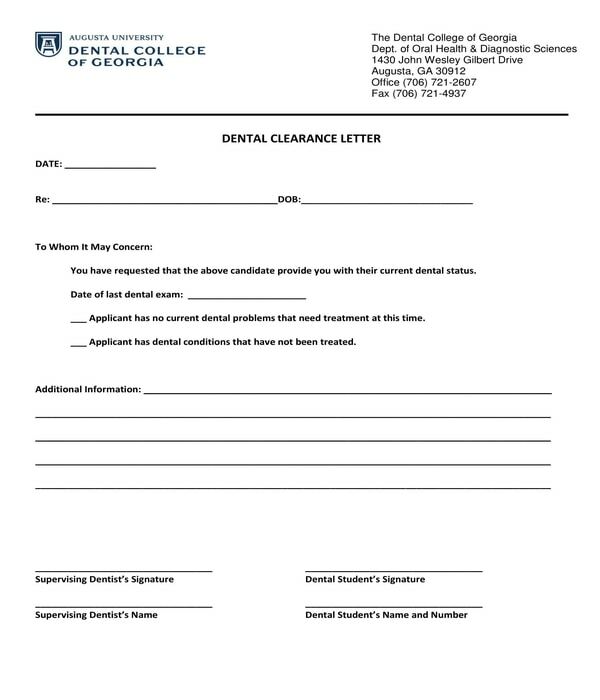 School Dental Clearance Form – If an individual plans to take up a course in dentistry or in the field of dentistry, he should represent physically and mentally as a good example for his future patients as a dentist which means he must be aware of his oral health and take corrective action to treat any concerns. This is why dental colleges require applicants who want to study in their institution to present a dental clearance. This document will indicate the conditions of the applicant’s oral health and whether or not there are any issues to be concerned of by the applicant and the institution. In addition, the parties who will be signing the form are the student applicant and the dentists. School Employee Exit Clearance and Release Form – School employees who will be leaving their employment should complete a school employee exit clearance and release form first before they will be permitted to leave their assignments. The form will ensure that the employee has returned all the valuables and properties of the school that he used during his employment for the purpose of his job. Moreover, the form will also be for keeping the data and confidential information of the school secured especially if the employee’s assignment involves data collection wherein he may use the information for other intents outside the knowledge of the school. 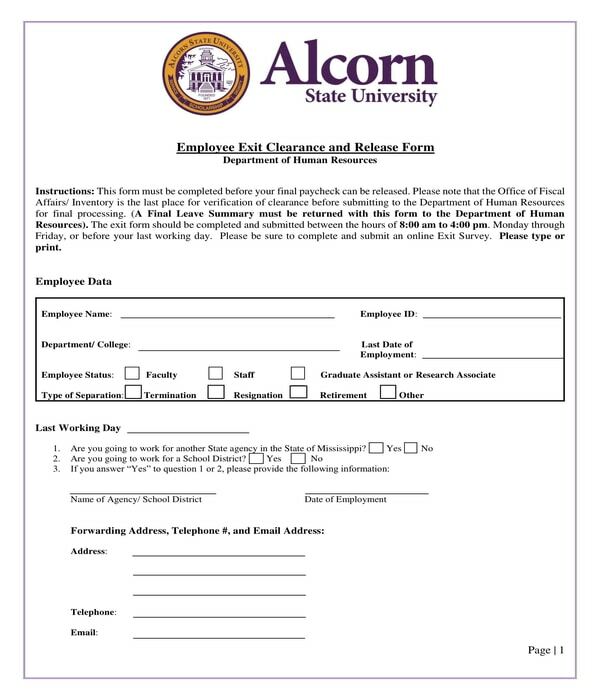 Lastly, a school employee exit clearance and release form can also be for documenting the approval of the employee to not sue or file any lawsuit to the school after his employment due to the release and any waiver that he signed. 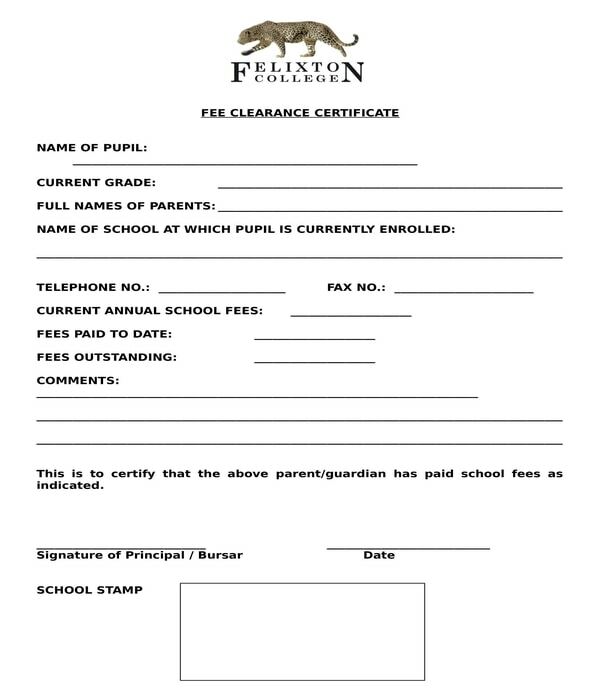 School Fee Clearance Certificate Form – With this form, a parent or a legal guardian of a student will be able to prove that he was able to pay the school fees on time and that his claims are verified by the student’s principal. In completing the form, the parent will have to state the name of his child as the pupil, the current grade level of his child, the name of his spouse and his own as the child’s parents, as well as the school where his child is attending in. Other pieces of information to include in the school fee clearance certificate form are the details of the parents’ contact information, the amount of the current annual school fees to be paid by the parent, the number of fees paid up to date, and the amount of the parents’ outstanding fees to be paid. Aside from the signature and verification of the school principal, a school stamp should also be incorporated in the school fee clearance certificate form which is for validating the fee claims and for indicating that the claims have been recorded by the authorized registering party of the school. School Laboratory Clearance Form – There are different types of laboratories present in an educational institution such as computer laboratories, research laboratories, and science or chemistry laboratories. 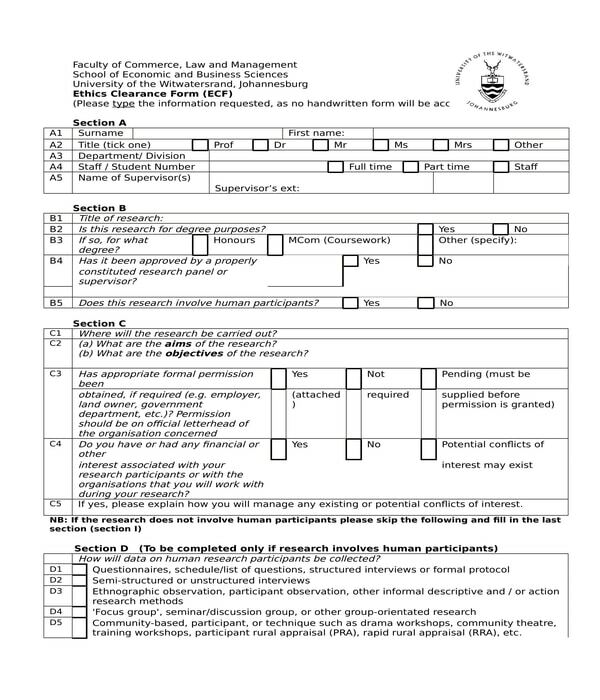 Regardless of the varieties of laboratories, students are required to complete a school laboratory clearance form to document their success in conducting the study and the meeting the laboratory requirements of the school in order for them to be able to proceed either to a course or to a graduate program. In a school laboratory clearance form, the student should have the approval and the signatures of the professors and officers in the school who are assigned for giving out laboratory clearances. 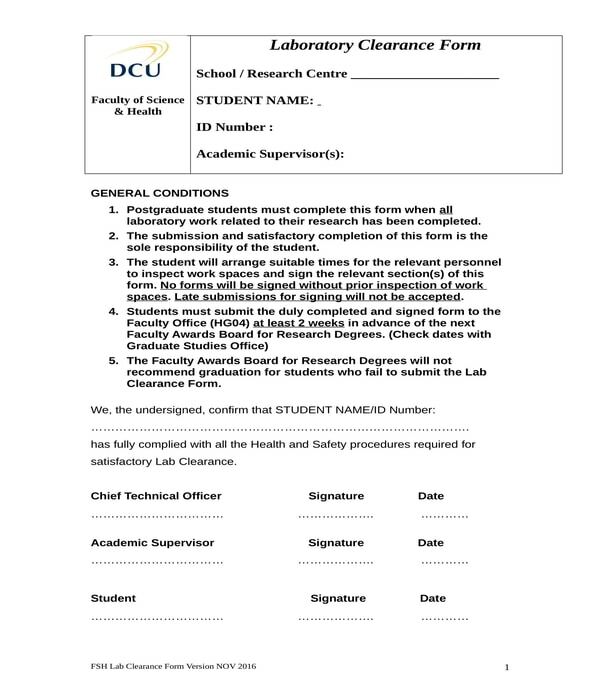 The list of items and materials which should be submitted by the student will also be indicated in the form such as the properly arranged and cleaned lab instruments, and the returning of the laboratory keys to the key-keeper or the person who has custody to keep school keys safe and intact. 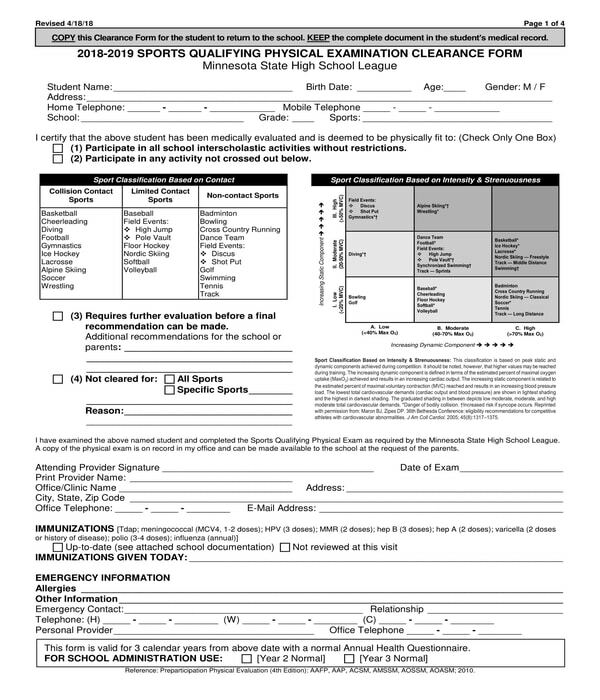 School Sports Physical Exam Clearance Form – Before a student will be able to proceed to an athletics and sports program, he will have to undergo a physical and medical examination wherein a school sports physical exam clearance form will be signed and should be completed by him and the school physician. The form is essential for determining whether or not the student is capable and can withstand the physical challenges related to his preferred sports or activities. The school sports physical exam clearance form is composed of ten sections which should be filled out by the involved parties. The first section of the form is generally for identifying the student who plans to be an athlete for the school. In the succeeding sections, the physician will be the one who will be filling out the entry fields. The second section of the form will be for indicating whether the student is free to participate in any type of sports or there are restrictions to note in lieu of the student’s medical assessment and records. This is also the section where the physician will be able to state the sports classification permitted for the student along the list of physical contact that the student must keep in mind, and the recommendations of the physician for the school and the student’s parents. 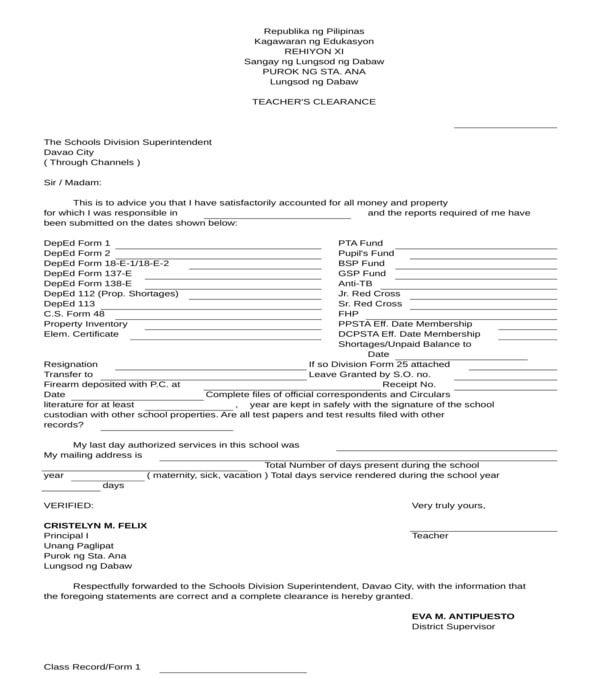 The third section of the form is intended for the physician’s information while the fourth and fifth sections are for acknowledging the immunizations that the student have acquired and will acquire, and the student’s emergency contact person. Additionally, the sixth and seventh sections are for the medical questions and followup information to be completed by the physician regarding the student’s health. The student’s medical exam information will be the eight section of the form while the ninth and tenth sections are for the eligibility agreement and statements. Student Clearance Form – If a student will be leaving the school either due to transferring to another institution or basically due to the completion of his course, he must complete a student clearance form. This form will document that the student has satisfied the obligations and responsibilities required by the school before his departure. 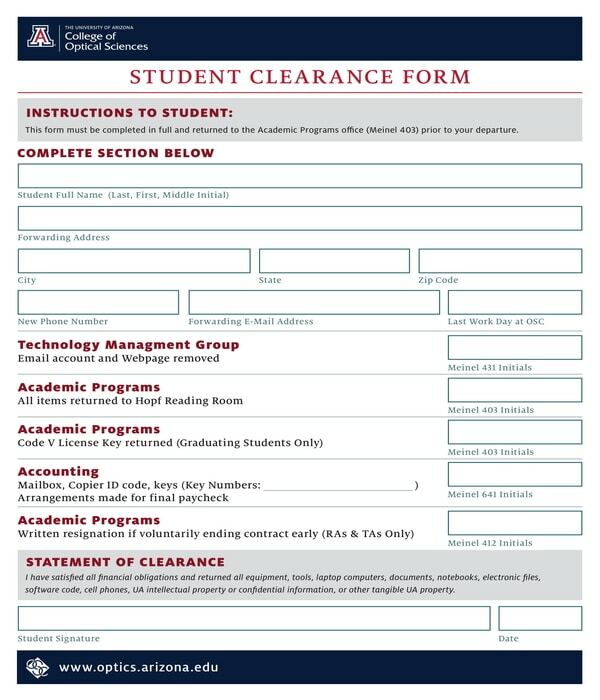 Personal data of the clearance recipient – The recipient of the clearance is the person who needs to acquire the “cleared” status in the school such as the student who needs to pass the medical physical exam to be an athlete in the school, and the teacher who will be leaving his employment. The data which should be collected in the school clearance form should include their legal names and their identification numbers, as well as their electronic mailing addresses and residential addresses for notice and informational purposes. Clearance requirement list – This refers to the list of actions and items which should be completed by the recipient of the clearance such as the items to be returned and the procedures to be done. Clearance approval section – This is where the signatures of authorized parties will be indicated. Along with the signatures, a comment line and a date area can be included as well to gather the statements of the people signing the form. Lastly, a school clearance form must be accompanied by a declaration and affirmation oath for the recipient of the clearance. This is specifically for documenting the intent of the recipient in completing the clearance and in providing sufficient and factual data and information for the process to be conducted in lieu of the school clearance procedure.